Formerly a division of the 21st Institute of China Electronic Technology Group, Ananda Drive Technology is among the earliest companies in China who developed and manufactured high power motors and controllers for the US e-bike market. Since 2001, Ananda has exported over 600,000 e-bike motors and controllers and has long been recognized for its R&D capability and consistent high quality. The most distinctive technology of the EBS R180 is the OLED display. Through programming, OLEDs can display different fonts, logos and pictures in a more flexible and personal way compared with LCDs. An OLED display works without a backlight, resulting in better power efficiency. OLEDs also have wider viewing angles and can respond well at temperatures as low as -40C. Ananda's 48V 500W rear direct drive motor is made of customized high performance electrical steel with reduced iron loss and improved motor efficiency. The peak torque can reach 50 NM. 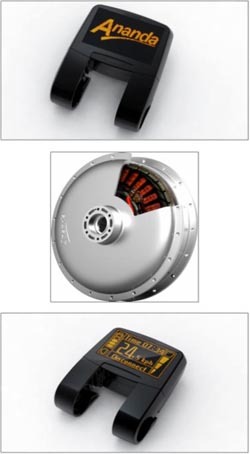 Another feature is the low noise of the motor resulting from the special cogging design which reduces the motor ripple. The controller is integrated inside the motor and uses the latest sine wave technology to ensure smooth start and upgraded riding experience. The integrated double-sided BB torque sensor can detect pedal force from both sides and increase power output sensitivity. In addition to the rear drive, Ananda also manufactures front and central motor systems. All products will be on display at Booth 37045-3 during Interbike 2012. New Ananda Drive Techniques (Shanghai) Co., Ltd was founded in 2001 and is headquartered in Shanghai, China. It is a leading specialist with more than 10 years of experience developing advanced drive system for e-vehicles. Our focus on innovation of the features, drivability, functionalities and performance enables us to create intelligent drive systems and components for e-vehicles, which have been widely applied and verified all over the world.